Portland, Oregon, is often referred to as a city that has gone further with “Smart Growth” than other cities. It promotes transit by train, streetcar, bike, and aerial tram. It has numerous award winning downtown parks and redevelopment sites. IMO, its planning reputation and branding sometimes exceeds its delivery. One site in particular is comparable to LeBreton Flats in terms of location (just outside the downtown core, on former industrial lands), although Portland’s South Waterfront is twice the area (402 acres vs NCC’s <200 acres). Portland’s has room to expand as it takes over adjacent industrial users; the NCC’s site abuts additional development lands: the Islands development area, the Gatineau shoreline, and Bayview Yards. Portland leads redevelopment with transit infrastructure. South Waterfront construction began in 2004; the streetcar connection to downtown arrived in 2006; and the aerial tram opened in December 2006. LeBreton led with road development (the Parkway / Wellington), the 2009 north-south LRT line having been aborted by the City. This transit oriented development in Portland can be explored first by “arriving by transit”. A long pedestrian bridge crosses the i5 (opened in 2012) that connects the area to the established communities on the other side of the freeways and upslope from the river edge flats. The aerial tram, opened in 2006, carries over 1million passengers per year, many of them students or hospital users, as the uphill station is the main campus of Oregon Health and Sciences U and the lower station is the start of their campus expansion. The aerial tram was largely funded by the University, and student/staff passes account for many users, ie the U pays for operations too. Non-U folks can buy a $4.35 round trip ticket. The tram rises 500′ in a run of 3300′; each car carries 57 people for the 4 minute trip. Cars leave on demand (if full), or at 6 minute frequency. The upper campus is severely underserved by roads, being on a mountain top, so the connection to the urban transit network via the aerial tram is very valuable. (below): From the top of the bridge stairs there is a view directly down to the transit plaza. That is a working shipyard immediately to the left, building barges. That 33 acres site will soon be redeveloped for more condos, which I think is a bit of a shame since our very-urban office-dwelling society is deeply severed from industrial work. The NCC, of course, is busy in Ottawa since Greber times to destroy all evidence of industry. The transit plaza has oodles of bike parking close to the tram/aerial bridge. Cyclists were using the bridge elevator. The dark gray lines border the single streetcar track that arrives from a parallel road one block beyond the building, and circle the building through a pedestrianized plaza. On the near side of the road, streetcars continue onwards through the redevelopment neighbourhood to the right..
Portland maximizes exposure to its transit facilities with very large red “Go By …” neon signs at various points around the city. These are examples of conspicuous city branding. (below) an example of shared use space, with pedestrians wandering over the streetcar tracks. I cannot imagine our traffic engineers approving, since there are (blind!) turns in the track, one might trip on the rail, etc. etc. (below): look closely at this entry-plaza point from the i5 ped bridge down onto the transit plaza and gateway to South Waterfront district. A bidirectional bike track arrives from the left, and crosses the road at a crossride while a portion of the track continues onwards to the right (the bike traffic from the right approaches from the far side of the road). Note the presence of a bus shelter; simple bar railings keep the cyclists and transit waiters separated. There is a raised crosswalk marked where pedestrian paths cross the bike track, but the two are adjacent and not fenced off throughout their parallel lengths. The cycle tracks are depressed just where they go behind the transit shelters, discrete and effective means of lane control. (below): this somewhat dizzying photo captures the rest of the sidewalk and bike track off to the left of the above picture. The cycle track is separated from the walkway by a gray brick strip, but in the higher conflict zone approaching the bus stop and crosswalks, the track is channelized. 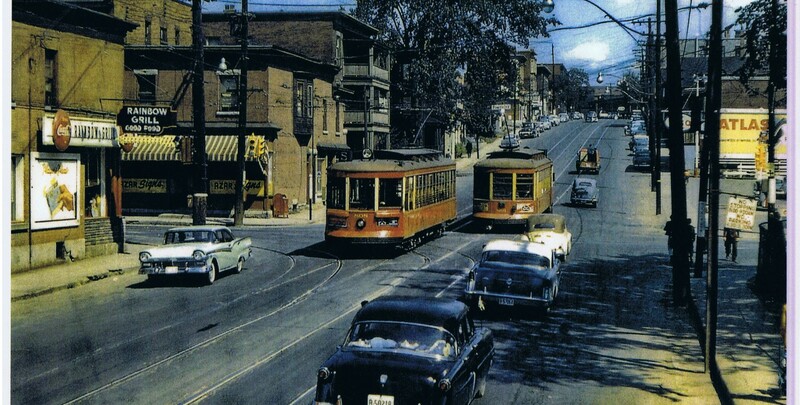 The streetlamps are in a classic streetcar era format, in a later story I’ll show you the same design that used to be on Somerset Street. (below): a closer view of the transit plaza. A tram is in the station. Each car carries 79 people. Plaza users have an open view into the shipyard (no giant board fence or tree screen). I was really interested to notice the cycling signage. It is clean, slick, modern. It is of a scale suited to pedestrians and cyclists. I really liked the new signage both for its appropriate scale and modernity. I cannot imagine we would use something like it because we are tied to the Ont Traffic Act and dominated by motorist standards and mindset at City Hall. But we can be inspired by what others do. (below): Looking off to the right from the foot of the i5 bridge crossing, the separated cycle track merges onto the road via a buffered transition zone and becomes a bike lane on the quieter local street. If you squint hard enough, you can see the cycle track rises to the level of the crosswalk (also visible in previous pictures). The whole plaza struck me as extraordinarily well thought out, and very very Dutch. next: buildings, parks, sidewalks … seeing more of how Portland builds a better Flats.